Agee makes helping others his life’s work. Under his guidance, nearly 370 students have created their own business models with more than 115 businesses launched successfully. Helping others and solving problems have long been dual priorities for Aubrey Agee II. As senior program administrator for Wayne State University’s Blackstone LaunchPad project, Agee has helped more than 4,000 people explore entrepreneurship and their potential for making the leap into a new enterprise. “Today I help folks who don’t always have all the resources,” Agee says. “I help people who don’t fit the particular image of someone starting a business.” That includes Wayne State students and alumni ranging in age from young people just starting out to older adults who want to put their life’s experiences to good use. He no doubt inherited that desire to help others from his father, one of the first black architects in Michigan. Agee grew up in his father’s office, learning how to draft as a child. His father was known for his kindness toward others, often meeting people on the street, hiring them for his firm and providing life-changing training in everything from carpentry and construction to facility management and architecture. 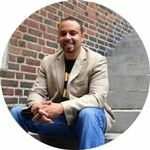 Agee graduated from Wayne State University, earning his bachelor’s degree in mechanical engineering and his master’s degree in business. After working for General Motors for 10 years, he launched his own start-up, V-Power, specializing in vibration energy harvesting devices. Subsequently, Agee took over the operation of a GE wind farm in the Michigan thumb area.